The best thing about having a summer birthday? The best thing about barbecue and ice cream? So besides throwing down on barbecue chicken (pinoy-style, of course), my gift to myself was to actually take the time to make one of my favorite ice cream flavors: salted butter caramel. Back when I started making this, I used David Lebovitz’s excellent recipe (you can find the original here). But because I’m – let’s face it – lazy, I started making the caramel in the water/sugar method, the way I do for leche flan (and I have made dozens of leche flans), and dropping the caramel praline. I figure that if it takes less time, I’m more likely to make it. And if I’m more likely to make it, then more caramel ice cream for everybody. And if you’re lucky, you’ll get some on your birthday. Place the egg yolks in a medium bowl and set aside. Add the sugar to a medium saucepan and pour the water over it. With the heat on low, swirl the pan around until the sugar has nearly dissolved. Be careful not to let it boil — if it starts getting too hot, remove it from the burner for a few seconds, continuing to swirl. Uncover and continue swirling the mixture until it becomes dark amber. (Be careful — you want it to be dark, but it can go from dark to burning in seconds.) Take it off the heat immediately, and stir in the butter and salt. It’ll splatter, but just keep stirring it to keep it from splattering. The butter will eventually incorporate. Gradually whisk in the cream until fully incorporated. Stir in the milk. Whisking constantly, add about a third of the warm caramel mixture to the egg yolks (careful not to curdle the yolks). Place the yolk-caramel mixture back into the saucepan with the rest. Heat the custard over medium heat, stirring constantly, until the mixture thickens a bit and hits 170F (77C). Remove from heat and pour into a clean bowl through a strainer. Refrigerate for at least 4 hours. Churn in an ice cream maker as directed. This is even better sprinkled with a wee bit of sea salt. So taking advantage of my new ice cream maker, I’ve decided to revisit some weirdo flavors I’ve been experimenting with over the years, back when I was using my plan-way-ahead-of-time Krups ice cream maker. I thought, “Why not a series?” so here’s the first one. I found a recipe for sweet potato ice cream in The Ultimate Ice Cream Book, but like all of Weinstein’s recipes, I modified it. (I often find his recipes sickeningly sweet, and at times even cut the sugar to a quarter of what he calls for.) I liked his idea of roasting the sweet potatoes so that they caramelize, so this is how I started my recipe. For whatever reason, the normal grocery stores in Holland don’t seem to carry sweet potatoes, and when they do, it usually is the normal pale type rather than the sweeter bright orange varieties. Don’t quiz me on the variety names– I have no idea really, besides “orange” and “yellow”. So anyway, they carry sweet potatoes / yams at the big open market, but being too lazy to go down there, I picked some up at the regular store for like, 3 euros a pound or something ridiculous. But given that it was going toward ice cream, I figured that perhaps it was worth the cost. 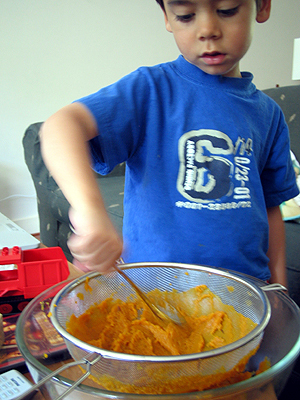 I started with what is developing into my standard custard base and mixed in the sweet potato puree that the four-year-old kitchen helper made with a strainer. (He was bored, I wasn’t letting him watch TV or play Gameboy that afternoon, so what was a boy to do?) If you don’t have a four-year-old kitchen helper, don’t worry; you can use a food processor instead. The result is a sweet ice cream that, for me, tastes like a cross between candied sweet potatoes and ube (purple yam). Those who eat it must be fans of sweet potatoes– if they aren’t, this recipe won’t convert them. But if you love candied yams, this will taste heavenly. Preheat the oven to 400 degrees F. Scrub the sweet potatoes, arrange in a baking dish and bake for 1 hour, or until the potatoes are tender enough to put a skewer through easily. Remove from the oven and allow to cool to room temp. Combine the eggs and sugar in a standing mixer. Beat until lightened in color and a ribbon forms. In a medium saucepan, bring the milk and cream to barely a simmer and slowly pour into the egg mixture, whisking the whole time to prevent the eggs from curdling. Transfer back into the saucepan. Peel the sweet potatoes. Add a pinch of salt, and using a sieve or a food processor, make a puree. Strain the custard into the sweet potato puree and make sure it’s well combined. Refrigerate for at least an hour. Freeze according to the instructions on your ice cream maker. 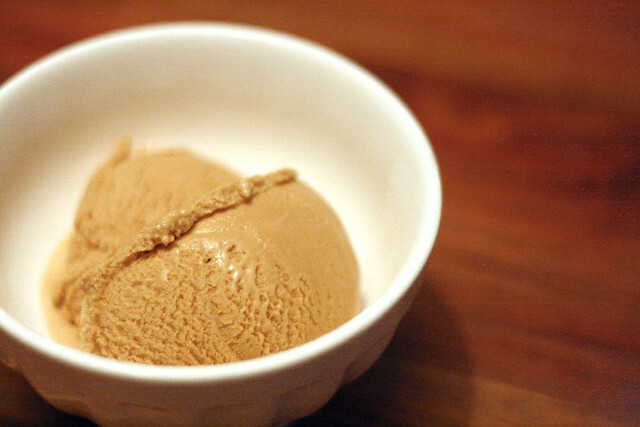 This ice cream tastes excellent with salted pecans! For my first time participating in the Food Blogger event Sugar High Friday, I settled on a tart that I make every now and then. The theme is “surprise”– as in surprise ingredient or filling. 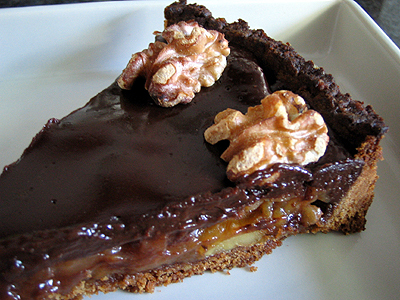 This was originally a recipe for a chocolate caramel walnut tart out of Cooks Illustrated (my favorite cooking mag), but I’ve adjusted it in a number of ways. Ever since I mastered making cajeta, the Mexican version of dulce de leche, I try to keep some on hand (for what else? waffles, of course). This is my favorite caramel: it gives an extra layer of flavor that comes from that cinnamon-y, extra-milky flavor and texture that only cajeta has (and dulce de leche possesses as well, sans cinnamon). 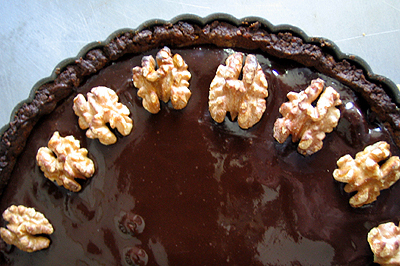 I also salt the walnuts and the ganache because salt is soooo good with caramel, and I’ve cut the amounts for the ganache because, well, a 9-inch tart shell just didn’t seem to have enough room for the ingredients called for. Another thing I really like about this tart is that the crust slices perfectly. I know that seems trivial, but anyone who’s tried to slice a good ol’ American fruit pie in front of company will understand why this is important– if you want actual slices rather than a pile of crust and filling on a plate, then have a go at this tart. For extra tasty walnuts, take all the walnuts in the recipe and toast in a 350-degree oven for about 8 minutes. Combine the walnuts and powdered sugar in a food processor and grind until well-combined. Add the flour and salt and process until combined. Add the cold butter until it resembles coarse bread crumbs. Add the egg yolk mixture to the food processor and run until the dough forms a ball. Remove and shape into a 6-inch disk. Wrap in plastic wrap and set in the refrigerator for 30 minutes. After 30 minutes, lightly flour two large sheets of cling wrap. Set the dough disk on one sheet, then cover with the other. Roll out dough with a rolling pin into a 13-inch sheet. Set on a baking sheet in the freezer for 15 minutes. Remove dough from freezer and peel off top layer of cling wrap. Overturn into a greased 9-inch tart pan. This dough is really forgiving, so just pat it into the pan and use the scraps that hang over the edges to make sure the crust is solid without holes or patches. Refrigerate crust in tart pan for 30 minutes. Preheat oven to 375 degrees. Place refrigerated tart pan on a baking sheet. Set a piece of foil in the crust and place pie weights in it, distributing evenly. Bake for 20 minutes. Remove the foil and pie weights and bake for an additional 10 minutes. Remove the tart shell from the oven and cool the whole thing, baking sheet and all on a cooling rack. Brush the inside of the tart shell with the reserved egg white from earlier. 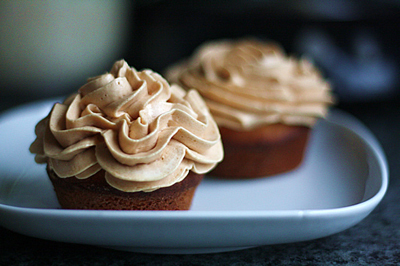 You should have approximately 1-1/2 cups of cajeta. Either let it sit at room temperature for a half hour or so, or heat it in the microwave for about 30 seconds to soften it a bit. Add the 1 cup of toasted walnuts. Pour the filling into the cooled tart shell, spreading evenly. Whisk the egg yolk with the one tablespoon of cream. Set aside. Place the milk and 1/4-cup cream in a small saucepan. Bring to a simmer. Remove from heat and add the chocolate and butter. Cover for 2 minutes. Use a spatula to stir the contents until you have a smooth chocolate mixture. Stir in the egg yolk mixture until smooth. Pour the mixture over the caramel filling in the tart shell, covering the whole thing. Preheat oven to 300 degrees and bake for 25 minutes until the filling is still shiny and a bit wobbly. 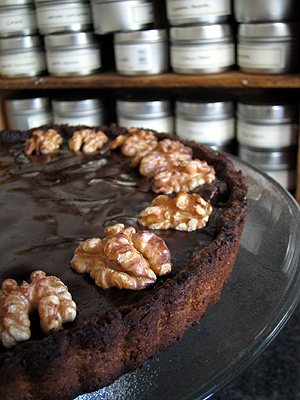 Arrange the salted toasted walnut halves around the perimeter of the tart. Cool on a cooling rack for 30 minutes, then refrigerate, uncovered, for 3 hours.